With Archtober – New York City’s annual Architecture and Design Month – almost upon us, it has got my theater archivist’s mind turning to the city’s history of theater buildings. So this week I offer up a brief (and by no means comprehensive) peek into some of the iconic playhouses in New York – some lost, some surviving. 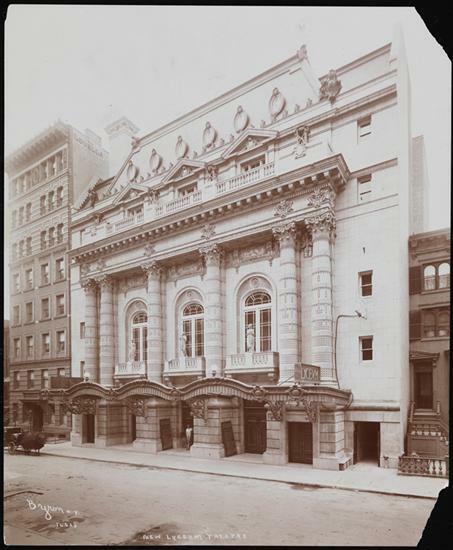 The first theater in New York after the Revolutionary War was the John Street Theatre. No images remain of the exterior of this modest structure, and the building closed its doors in 1798. Thankfully, the New Theatre (soon called the Park Theatre) opened up on Park Row the same month. Cigarette card. 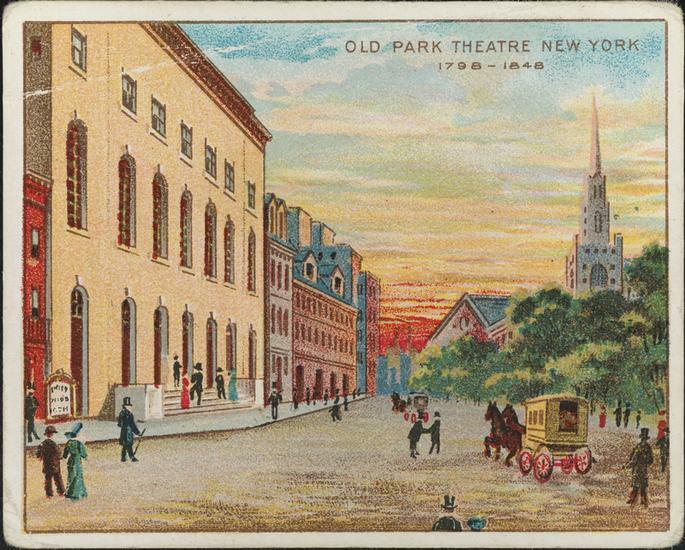 Old Park Theatre New York, 1798-1848. ca. 1910. Museum of the City of New York. X2011.38.15. For the first decade or so, the Park Theatre prospered without competition, but as New York grew, more theaters began appearing. With its offerings of imported English dramas and Italian operas, the Park gained a reputation as the theater of the elite, where the rich and famous went to get their culture. On the other end of the spectrum were the working class audiences of the Bowery Theatre. Built in 1826, the Bowery became known for championing populist American ideals and American performers like Edwin Forrest. Class and cultural identity became strongly tied to both theaters, and where you went to be entertained said a lot about who you were. Engraving. 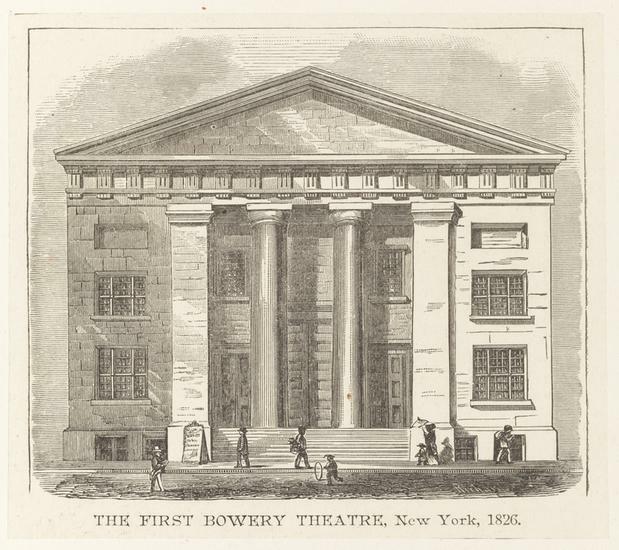 The First Bowery Theatre, New York, 1826. Undated. Museum of the City of New York. F2011.37.8. If 19th century theaters had one enemy (besides each other), it was fire. The Park Theatre burned down on December 16, 1848 and was not rebuilt. Not to be outdone, the Bowery Theatre burned down four times between 1828 and 1845 and each time was rebuilt. Finally, it met its end when a fire in 1929 demolished the building permanently. Fires didn’t always bring destruction alone, however. In fact, a fire at the Academy of Music actually gave rise to the first musical, or so the story goes. When a dancing troupe from France was deprived of their venue, William Wheatley, the manager at Niblo’s Garden on Broadway near Prince Street, invited the company to join forces with The Black Crook, a spectacular melodrama scheduled for that space; and thus, the first musical was born. Engraving. [Niblo’s Garden.] ca. 1865. Museum of the City of New York. 29.100.850. 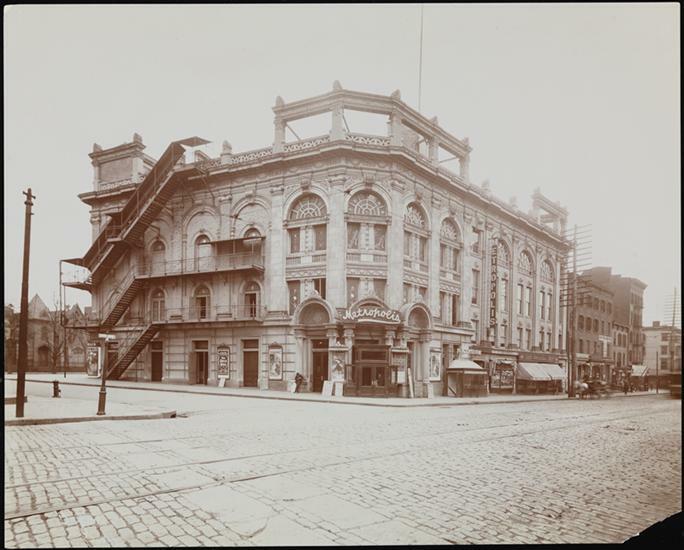 When Niblo’s closed for the last time in 1895, theater buildings had already begun to move uptown. A clear trajectory can be seen in various theaters run by the father-sons combo of James W., James, Jr. and Lester Wallack who took their name with them when they moved. 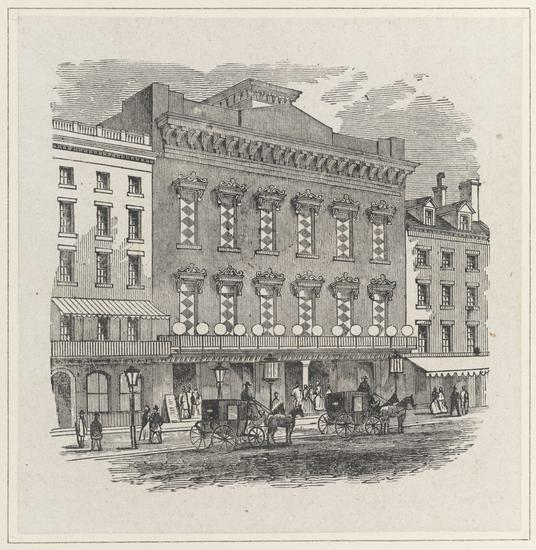 The first Wallack theater was an 1852 takeover of John Brougham’s Lyceum at 485 Broadway. The Wallacks built their own space nine years later at 844 Broadway (pictured below), then kept moving uptown. 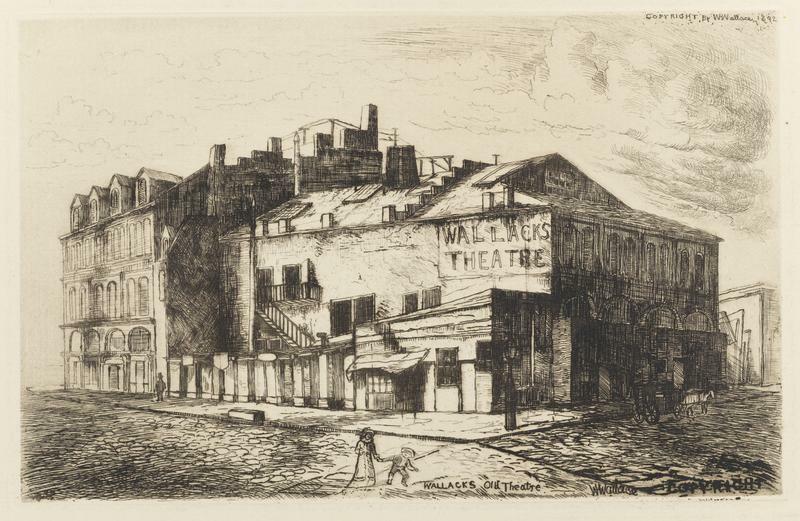 Next came the Wallack’s Theatre at Broadway and 30th Street in 1882, and finally, in 1924, the Wallack name had a brief run at a theater on 42nd Street in the final resting place of many theatrical playhouses, the Times Square Theater District. William H. Wallace. Wallack’s Old Theatre. 1892. Museum of the City of New York. 29.100.840. The oldest continuously operating playhouse in Times Square Theatre District is the Lyceum Theatre on 45th Street, which opened November 2, 1903. Though the New Amsterdam Theatre and the Hudson Theatre opened earlier that same year, both spaces flirted with careers as movie theaters. The Lyceum holds the distinction of being the District’s oldest continually play-producing theatre, and in 1974, it was the first Broadway theater to be landmarked. 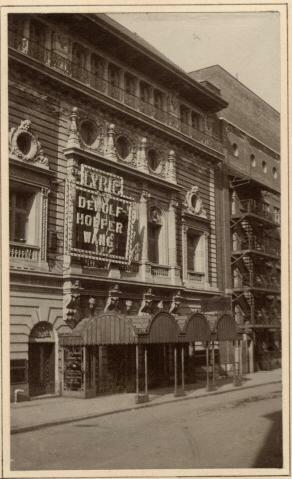 Byron Company (New York, N.Y.) Theatre, Lyceum (New) 149 West 45th Street. 1903. Museum of the City of New York. 93.1.1.15577. The newest building on Broadway is the Lyric Theatre on 42nd Street. Built in 1998, the space opened as the Ford Center for the Performing Arts, then the Hilton Theatre, then Foxwoods Theatre before finally being christened the Lyric in 2014 after the theatre that stood on the same location but was demolished in 1996. Below is a picture of the original Lyric. George F. Arata. [Lyric Theatre.] 1904. Museum of the City of New York. 43.316.55. The serial renaming experienced by the Lyric Theatre is just one example of the changes that can happen in the life of a building. Many of the long standing theaters in Times Square have gone through several reinventions. The New Victory Theatre just up the block from the Lyric, for example, was originally called the Theatre Republic; the space was built in 1900 by the first Oscar Hammerstein (the grandfather of the Oscar we know so well from Rodgers &). It was run briefly by producer David Belasco before his own space was built on 44th Street. In the 1930s it was a venue for burlesque, in the 1940s it was renamed the Victory Theater and showed mostly second-run movies – which by the 1970s, had become X-rated movies. Reopened in 1995 as a performance space, the New Victory Theatre currently runs children’s theater and family-focused programming. 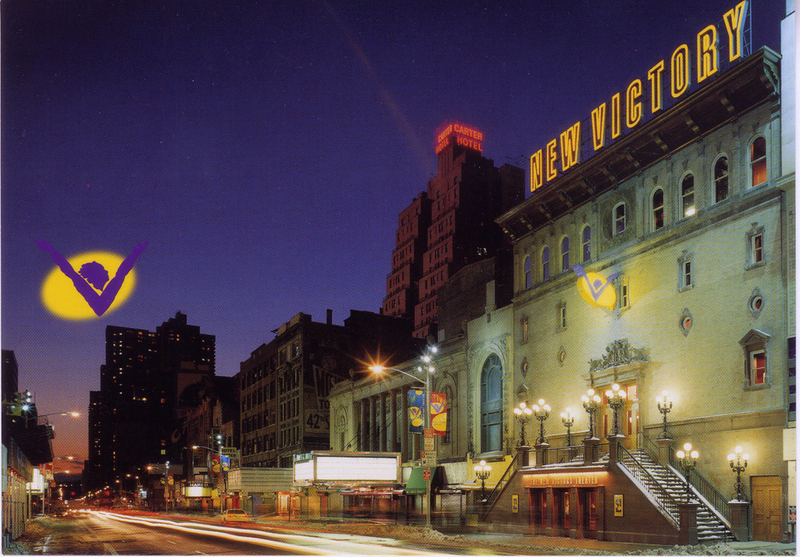 Postcard of the New Victory Theater, 1995. Museum of the City of New York. Collection on Theatrical playhouses. Of course, the entertainment and high culture were not restricted to only those in Manhattan. A variety of theaters could be found in all five boroughs in the late 19th and early 20th centuries. The Metropolis Theatre was one of several theaters in the South Bronx. Built in 1893, it eventually expanded into the burgeoning motion picture industry to escape competition with the neighboring Bronx Opera House that opened in 1913. Byron Company (New York, N.Y.). Theaters, Metropolis Theatre. 1903. Museum of the City of New York. 29.100.1197. Renewal and reuse of theaters was also not limited to Manhattan. The Majestic Theatre in Brooklyn opened in 1904 is currently enjoying life as the Brooklyn Academy of Music’s Harvey Theatre. 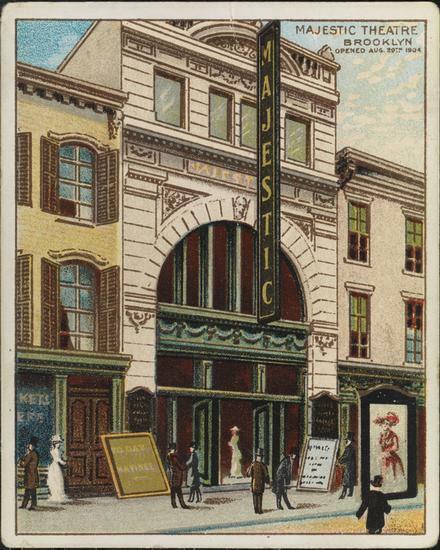 Cigarette card for Majestic Theatre, Brooklyn. ca. 1910. Museum of the City of New York. X2011.38.13. 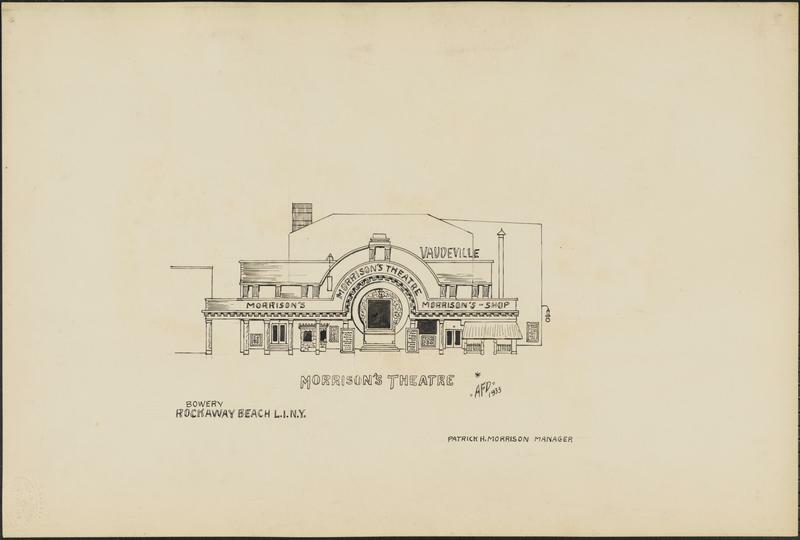 Further afield from the city’s center, Morrison’s Theatre on Rockaway Beach in Queens was lavishly decorated and seated 1,500. Primarily a summer season venue, the theater had success providing twice-a-day entertainment to those seeking cooler temperatures by the sea. Anthony F. Dumas. Morrison’s Theatre. 1933. Museum of the City of New York. 75.207.41. Staten Island had several dedicated performance spaces so its residents didn’t have to get on a ferry boat to see theater. Below is Richmond Theatre on Thompson Street in Stapleton, built in 1906 and torn down around 1948. 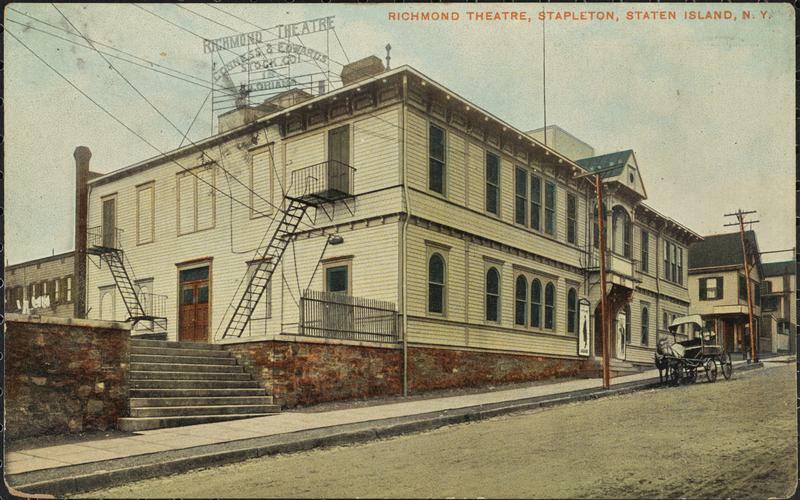 Temme Co. postcard of Richmond Theatre, Stapleton, Staten Island, N.Y. ca. 1908. Museum of the City of New York. X2011.34.2604. For more on New York City theaters, check out the finding aid to the Museum’s recently processed Collection on Theaters available through our Catablog. This entry was posted on September 27, 2016 by Morgen Stevens-Garmon in Photo Archive, Postcard Collection, Theater Collection and tagged 19th century, 20th century, Anthony F. Dumas, Architecture, Broadway, Byron Company, Ephemera, Playhouses, postcards, Prints, Theaters, Times Square.